One of the biggest problems facing Windows Phone and Windows 8 are the lack of popular apps. Sure Windows Phone has over 175,000 apps available but many of the most popular ones found on Android and iOS have been missing. Official apps for Instagram, Vine, and Flipboard were some of the most notable missing apps and while there were third party apps that gave some of the features to replace those apps, they didn’t always offer the full experience and were at risk of being shut down by the official apps. Well, the wait for these apps is almost over. Today in Abu Dhabi Nokia announced that in the “coming weeks” Instagram, Vine, Flipboard and Temple Run 2 will all be coming to Windows Phone. We don’t have exact release dates for any of these apps but this is big news for Windows Phone users. Nokia already makes one the best phone cameras out there with the 41-megapixel Lumia 1020, and having two of the most popular photo and video apps in Vine and Instagram will only make it better by making it much easier for people to share what they shot. In addition to the above four, Nokia also announced that other popular apps like FIFA 14 and Papyurus will also be coming to Windows Phone over the next few weeks. And while these apps don’t solve all the app problems with Windows Phone, they sure do help a lot. We already knew the price and launch games but today Microsoft decided to announce the final missing detail about the Xbox One– it’s release date. The next Xbox will be here on November 22nd for the previously announced price of $499.99. Yes, if you ever wanted Black Friday to get any crazier then releasing a new Xbox the week before will give you your wish. Sure it’s a week later than the PS4, but it’s coming. And that’s all that really matters, right? The PS4 isn’t the only new console making big news. While Sony was announcing the final missing details from the PS4’s launch– the November 15th release date and the launch games expected out around that time– Microsoft announced the launch games for their Xbox One. Assassin’s Creed IV Black Flag, Battlefield 4, Call of Duty: Ghosts, FIFA 14, Madden NFL 25, NBA 2K14, NBA LIVE 14, Need for Speed: Rivals, Just Dance 2014, LEGO Marvel Super Heroes, Skylanders: Swap Force and Watch Dogs. In addition to those games the Xbox One will also have a few exclusive games like Fighter Within, Forza Motorsport 5, Killer Instinct, Lococycle, Peggle 2, Powerstar Golf, Zoo Tycoon, Zumba Fitness: World Party, Crimson Dragon, Dead Rising 3 and Ryse: Son of Rome. Of course, unlike the PS4 which has a price and release date, the Xbox One still only has a price– $499 when it comes out sometime this fall. Microsoft still hasn’t said when exactly this fall that will be, though the latest rumors point to a November release around the same time the PS4 will be available. Then again, with all the changes Microsoft’s been making to the Xbox One these past few weeks (like with changing their stance on what you can do with your used Xbox One games) it is very possible that an exact release date still hasn’t been fully decided upon. All we know is that it can’t get here soon enough. While it’s not as nice as last year’s buy a PC and get an Xbox 360 deal or even this year’s Apple deal, Microsoft’s new back to school deal may make purchasing that new computer a bit cheaper. Well, so long as that new computer is a Surface. Microsoft’s online store is offering 10% off on any new Surface (the Pro with full Windows 8 and the recently discounted Surface RT), as well as 10% off any Surface accessories like the cool “click on” Touch or Type covers. With this deal you’d be getting a new Surface RT with a Type cover for a little over $400 (usually $450) or a Surface Pro 64GB for around $810 (usually $900). This discount also works for accessories like headphones, speakers, cases, mice and any other things you’d buy to help accessorize your Surface. Sadly this 10% discount looks to be Surface-only and doesn’t seem to work if you’re looking to buy a regular laptop made by any other company from the Microsoft Store. In addition to this 10% off Surface deal, the Microsoft Store is also offering the same Office 365 deal being offered by Staples and Best Buy: buy a touch-enabled PC and you’ll get Office 365 University free for 4 years. This Office deal does include touchscreen laptops made by other companies like Lenovo, Samsung and HP but for some reason doesn’t seem to apply to the Surface Pro (at Best Buy and Staples you can get Office 365 University free for 4 years even if you buy a Surface Pro over a touchscreen laptop). Both deals need you to verify that you are a college student by using the .edu email address provided to you by your school. For the Surface deal you can do this before you buy by heading over to this site, while if you’re taking advantage of the free Office deal at the Microsoft Store you’ll be prompted to verify your student ID at check out. For all the info head on over to the Back to School section of the Microsoft Store. Microsoft Drops The Surface RT Price To $350– But Should You Care? Last year Microsoft did something radically different when it came to new PCs. In addition to releasing the more touch friendly Windows 8 and Windows RT, they announced their own Surface line of tablets to go with it. These Windows tablets were designed and made by Microsoft directly– not HP, Lenovo, Acer, Dell or any other Windows PC maker and they have nice designs and some cool keyboard covers that “click” in (like in these ads for the Surface that were seemingly everywhere earlier this year). Over the weekend Microsoft dropped the price of the 32GB Surface RT down to $350, and the 64GB Surface RT down to $450 (both a discount of $150). With back-to-school season approaching this would seem like a great deal, but you may want to wait before you buy a new Surface RT. With the end of the spring semester, graduations and the school year in general coming to a close over the next couple of weeks you may think that now would be a good time to buy a new computer. Graduation gifts and early back-to-school deals make that idea seem even better. Well put simply, it’s just the opposite and buying a new computer now is something you should really try not to do regardless if the next computer you plan to get is a Mac or Windows. Here’s why. Could The Next Xbox Be Announced Next Month? Back in February Sony officially announced the PlayStation 4 and showed off its new controller, graphics and social features. And while Sony didn’t show what the PS4 actually looks like or say how much it would cost, it did promise that their new console would be available in time for the holidays of this year. The PS4 and the Nintendo Wii U make two of the three next-gen consoles, and over the last year the anticipation has been building over when Microsoft would announce their next Xbox (also known as the Xbox 3, Xbox 720, and Durango). While it was long believed that Microsoft would wait until E3 in June to announce the new Xbox, according to some of the latest rumors our long wait for the next Xbox may end even sooner. According to a recent reports by The Verge and Paul Thurrott (someone who follows Microsoft and would know about some of their plans), Microsoft may be planning an event to officially announce the next Xbox as soon as May 21st. E3 starts only a few weeks later on June 11th, and The Verge expects Microsoft to announce the next Xbox in May and then use E3 in June to fully show it off. As for what can expect in terms of the specs for the new Xbox, think of something that will rival the PS4. The next Xbox is rumored to pack an 8-core AMD processor, 8GB of RAM, 500GB hard drive and a Blu-ray drive for playing games (games can also be downloaded from Xbox Live). By comparison, the Xbox 360– which still is a pretty great system with some impressive graphics– has a three core processor and 512 MB of RAM. If these rumored specs are true then expect the graphics on the next Xbox to pretty much blow your mind. As with the 360, gaming is just one part of what the Xbox can do and the next Xbox is also expected to come with an updated version of Kinect that will allow for better use in smaller rooms, improved tie-ins with Windows 8 and Windows Phone, and the ability to control your TV and cable box. The next Xbox is expected to be available later this year and pricing is rumored to be in the $300-$500 range (or what the 360 was when it came out eight years ago). All in all, between this and the PS4 it looks like the next video game console wars are finally almost upon us. As always, stay tuned. Curious to try out Microsoft’s new Office 365? Just got a new PC or Mac and want a demo version of Office to use so you don’t need to buy it right away? Well you’re in luck as Microsoft just announced a new deal for students that you are going to want to check out. Usually Microsoft lets people download demo versions of Office for just one month, but starting today Microsoft will allow college students and teachers to get 3 free months of Office 365 and an extra 20 GB of Microsoft’s Skydrive cloud storage (giving you 27 GB of free storage in the cloud. Skydrive is Microsoft’s version of iCloud/Google Drive/Dropbox and allows you to easily access any files you store on there from anywhere you have internet access). All you have to do to get this deal is go to the Office for Students site and sign up using your .edu email address. That’s it and it will get you the free 3 months of Microsoft’s latest and greatest version of Office, including full versions of Word, Excel, PowerPoint (if you’re on Windows or Mac) and OneNote (Windows-only). And if you share the offer on Facebook you will get yourself an additional 3 months of free Office. Office 365 University usually costs $79.99 a year for students (for up to 4 years, after that it is the usual $99.99 a year non-students pay), but with this you can make that deal for cheaper Office last an extra semester longer. Windows 8 has been around since last October, and at just $40 it is a solid upgrade. We still like Windows 8, but tomorrow it’s about to see a major price jump all the way up to $200. You see, back in October when Windows 8 launched, Microsoft offered the Windows 8 Pro upgrade at a special price of just $40 for a limited time. Tomorrow, February 1st, is the day when that “limited time” officially ends. Even if you’re still on the fence about upgrading your Windows XP, Vista or 7 computer to Windows 8 it may be worth looking into buying the upgrade tonight while its $160 cheaper. Now for students this price jump won’t be as steep as Microsoft will be offering Windows 8 Pro to any US college student or faculty with a .edu email address (so college students only) for $70. That’s still $30 more than the “limited time” pricing but it’s still much better then what you would be spending if you aren’t in college. In other student news, Microsoft has also announced that starting on February 18th they will be doing a campus tour, visiting over 150 colleges across the US to show off the latest Windows 8 PCs and tablets. To see when they will be visiting a campus near you check out Microsoft’s site here. To get in on the Windows 8 $40 pricing, head over to the Microsoft Store here. Whether you are in high school or college, PC or Mac, there is one program that pretty much everyone uses, and that is Microsoft Office. Yesterday Microsoft released the next version of Office, called Office 2013 and Office 365. Both versions of Office have the same Word, PowerPoint, OneNote and Excel at its core that we all know and love and you can still easily take notes and make documents, presentations and spreadsheets. In Office 2013, Microsoft has added some pretty useful features including the ability to edit PDFs in Word (so when someone sends you a form to fill out you don’t need to print it and fill it out by hand), and better templates and themes for PowerPoint including some new themes designed for widescreens (so your presentations look better even when shown on an HDTV). Microsoft also made some improvements to make Office look much nicer and be much easier to use on Windows 8 touchscreens and tablets. And while these are just some of the many nice improvements to the classic Office apps, the biggest news here is the pricing. In the past you had one option when it came to getting Office and that was to buy it. You would own that version of Office and be able to put it on up to 3 computers (assuming you bought Office Home and Student). While you can still buy Office, Microsoft today also announced the availability of Office 365, a version of Office 2013 that you pay for monthly or yearly instead of just buying it outright. With an Office 365 subscription Microsoft offers some interesting benefits including 60 free Skype minutes a month for calling cell phones or landlines from Skype (Microsoft bought Skype a couple of years ago), constant software updates so your version of Office is always up to date, the ability to install on up to 5 PCs or Macs (the Macs would the most recent version of Office for Mac, in this case Office for Mac 2011), and 20 GB extra of SkyDrive storage (Microsoft’s version of Dropbox, iCloud, Google Drive etc.) so you can save all of your work online “in the cloud.” The coolest feature of all though is the ability to go online and stream your version of Office to any computer running Windows 7 or Windows 8. This means that you can go to a friend’s house or a computer in school and be able to use the latest version of Office on that computer without having to re-download the new Office. And on other computers like Macs or Windows XP computers you can do this through any browser just by going to office.com. 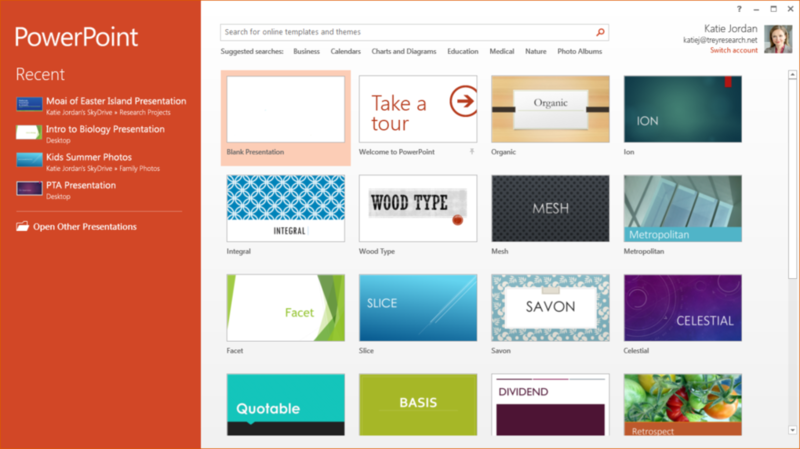 Office 2013 Home and Student– Includes Word, OneNote, PowerPoint and Excel. $139.99 to own for one PC forever. Office 365 Home Premium– Includes Word, OneNote, PowerPoint, Excel, Outlook (the famous email app), Publisher (for creating things like brochures and flyers– a very under-rated Office app), Access (for creating databases). Renting for $99.99 a year or $9.99 a month. This also has all the Office 365 features mentioned above like the Skype minutes, installing on 5 PCs or Macs, streaming Office apps and extra Skydrive storage. Office 365 University– All the benefits of Office 365 Home Premium but for students. The pricing of Office 365 University is $79.99 a year for 4 years, though you can only install on two computers instead of 5. As of right now this looks to be for college students only, but we’ve reached out to Microsoft to see if high school students can take also advantage of this deal. Now what version is best for you? That’s a tough question. Microsoft is pushing the Office 365 version hard, and its got a lot of great features. If your family has multiple computers or you and a couple of friends all just got new computers and all need to buy Office– and someone in either group is still in college– it may make sense to get the Office 365 University pack. Yes you don’t actually “own” it and will need to pay $79.99 a year, but when divided between multiple people it looks like a great deal. If it’s just you, then getting the Office 2013 Home and Student edition could be your best bet as you will actually be owning all the main parts of Office– Word, OneNote, Excel and PowerPoint– forever. We’ve only spent a couple of minutes with Office 2013, and while its very good and we like it, we still need to look at Office 365 to see which will be the better deal. For those curious about to try out the new Office for themselves, Microsoft is offering a free one month trial here, though be careful to make sure that it doesn’t accidentally delete you older, purchased version of Office by mistake (it shouldn’t but better make sure you don’t see a screen saying “we need to remove older versions” just to be safe). For all the details on whats new in Office 2013 check out Microsoft’s Office site here. UPDATE: A Microsoft spokesperson let us know that only “full- and part-time enrolled university and college students, faculty and staff” will be able to take advantage of the Office 365 University deal. Sorry high school readers.